Sept '09 to Nov '09. 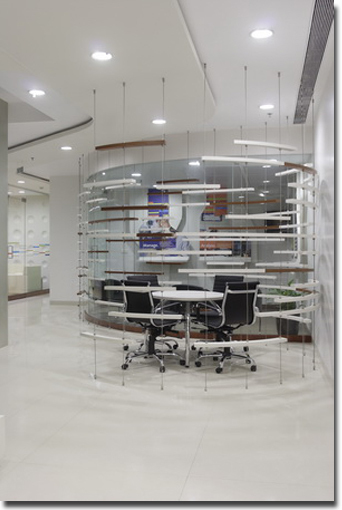 Sybase is a multinational software solution firm, expanding rapidly in India .The new office space was thought of as an overall strategy initiated by the need to reiterate its corporate work culture and also define it as a brand. Our design approach was focused on enhancing the social environment, branding the company in 3- dimension and expressing and enabling its corporate culture, by means of architecture. Keeping overall design feel contemporary; we added some fun design elements in meeting and common areas. Also drew some inspiration from the Indian culture at places to establish a local context. The design elements express well the insight of the people working which is modern, futuristic, innovative, accretive and structured.